Geopolitical gamesmanship is flaring anew between America and Russia, which spells persistent long-term demand for cybersecurity products. "Intelligence work has one moral law: it is justified by results," wrote John le Carre in the 1963 thriller, The Spy Who Came in from the Cold. Consider President Ronald Reagan's famous words in 1987: "Mr. Gorbachev, tear down this wall!" And the wall did fall, literally and metaphorically. The Berlin Wall went up in 1963; November 1989 marked its official collapse. Two years later, the Soviet Union dissolved, ending nearly 50 years of Cold War. The U.S. claimed victory. Now welcome to Cold War II. Spying and secret subversion again embroil the two superpowers America and Russia, which spells huge, multi-year demand for cybersecurity companies. This time around, the goals of the Cold War are even murkier. By getting cozy with President-elect Donald Trump, is Russian President Vladimir Putin seeking better relations, or is the former KGB colonel trying to undermine his old adversary the U.S. from within? Putin stands accused by the White House and U.S. intelligence services of "hacking" the 2016 presidential election, to help his preferred candidate Donald Trump. It's even alleged that Russian intelligence holds compromising evidence about Trump, although major news organizations have yet to verify or substantiate those allegations. In turn, Trump is accused of harboring myriad secret (or at best opaque) business deals with Russian interests. At times, Trump seems to be championing the Kremlin's core policy aims at the expense of America's Western alliances. It all reads like a le Carre novel, but the stakes (and potential profits) are real. Both cybersecurity stocks highlighted below, Cisco Systems (CSCO - Get Report) and PureFunds ISE Cyber Security ETF (HACK - Get Report) are poised for market-beating growth and should weather the expected economic downturn in 2017 better than most investments because of the recession-resistant demand for cybersecurity products. Cisco Systems is a holding in Jim Cramer's Action Alerts PLUS Charitable Trust Portfolio. See how Cramer rates the stock here. Want to be alerted before Cramer buys or sells CSCO? Learn more now. Cisco Systems is a leader in producing cybersecurity products. The company's networking equipment, routers and switches are found in public and private offices worldwide. End users rely on Cisco technology to foil cybercriminals. Meanwhile, the company's cloud-based solutions are increasingly popular. In addition to continual innovation, one of Cisco's biggest advantages in the cybersecurity field is the company's pervasive client base, which has already installed the company's equipment. That's a ready-made "annuity" for the company in the form of continual upgrades. 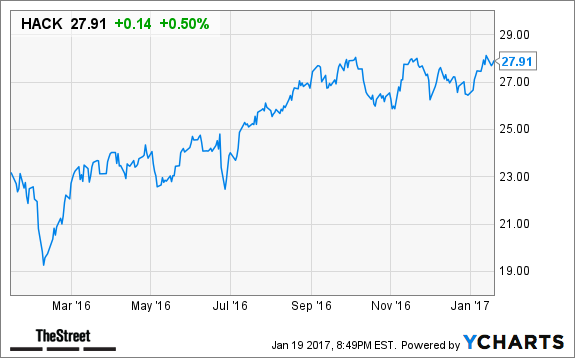 According to the average analyst estimate, Cisco's earnings should grow next year by 5.1% on a year-over-year basis. For the next five years, earnings growth is pegged at 9.16% on an annualized basis. Yet the stock's trailing 12-month price-to-earnings ratio is only 14, compared to 24.8 for its industry. The dividend yield is a hefty 3.47%. Buy this "cold warrior" while it's still cheap. If you prefer the safety and stability of a fund, consider PureFunds ISE Cyber Security ETF, which tracks the performance of companies worldwide that are direct service providers for cybersecurity. Founded in November 2014, the fund is the world's first cybersecurity ETF. With net assets of $737.77 million, the PureFunds ISE Cyber Security ETF's top holdings are the leaders in cybersecurity, including Cisco Systems, Science Applications International, Qualys, Fortinet, Proofpoint, Palo Alto Networks and Juniper Networks. The fund's expense ratio is 0.75%, in line with the average for its class. 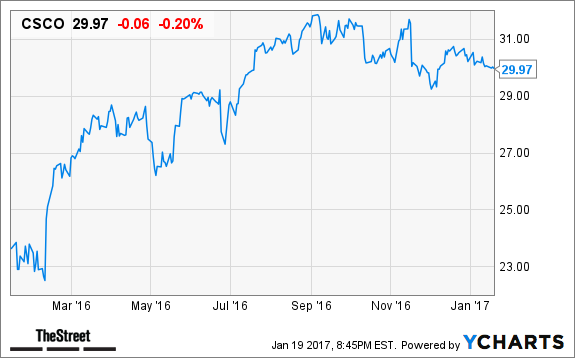 The ETF racked up a total return of 3.23% in 2016; year to date, it has returned 3.36%. As the Putin-Trump dynamic increasingly resembles a spy thriller, look for Cisco and the PureFunds ISE Cyber Security ETF to benefit and reward shareholders. I can tell you with absolute certainty that America is in deep trouble. And the crisis looming on the horizon has the potential to make 2008-2009 look like child's play. The window to protect yourself is rapidly closing. I'll show you how here. This article is commentary by an independent contributor. At the time of publication, the author held shares of CSCO.